Launch of the SpaceX Falcon Heavy on February 6, 2018. In a move that should come as a surprise to absolutely no one, SpaceX is postponing its plan to send a pair of private citizens on a trip around the Moon. Elon Musk’s venture into the space tourism industry is going to have to wait. The Musk-led company announced the lunar flyby project on February 27, 2017, saying two unnamed citizens had signed up, and that they had paid a “significant” deposit. Plans were put in place to start health tests and training, but it seems the company had gotten a bit ahead of itself. 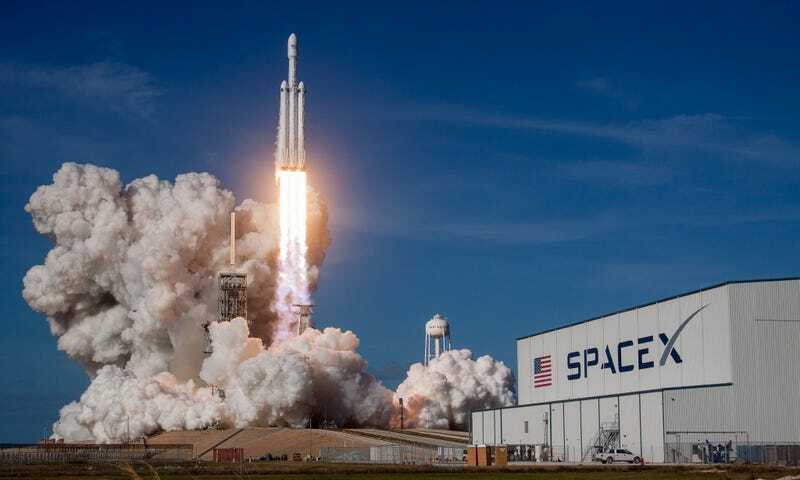 Indeed, SpaceX is no stranger to delays; the Falcon Heavy rocket finally went up in February following years of postponements. SpaceX hasn’t offered a reason for this most recent delay, but the WSJ said “technical and production challenges” likely forced the postponement. SpaceX is poised to make big money from space tourism, a new revenue stream that could further its goal of eventually establishing settlements on the Moon and Mars. But it also carries risk. A calamity involving private citizens would complicate the company’s relationship with NASA, which is counting on the Dragon 2 capsule for its missions to the International Space Station. That said, NASA is also working with Boeing, which is currently working on the Crew Space Transportation (CST)-100 Starliner—a capsule that, like Dragon 2, will take astronauts (and possibly private citizens) to the ISS, among other space-based destinations. For a company as ambitious as SpaceX, delays are par for the course. Moving forward, however, the company’s overreaching announcements need to be met with skepticism. SpaceX is doing truly pioneering work, such as lowering the costs of getting into space and introducing the world’s first reusable rocket, but the company has also proven that it’s very good at generating hype.